Kenya have replaced Bobby Williamson as coach of the national team with former youth coach Stanley Okumbi for the next round of Africa Cup of Nations qualifiers. The newly elected Football Kenya Federation (FKF) president Nick Mwendwa said Okumbi, who coached Kenyan premiership side Mathare United last season, will take interim charge of the Harambee Stars when they play Guinea Bissau next month. Williamson had been the Kenyan national coach since August 2014. He was believed to be owed up to $30,000 in salary arrears by the former FKF administration. Mwendwa made his decision to overhaul the coaching set-up following a meeting with Williamson on Monday. 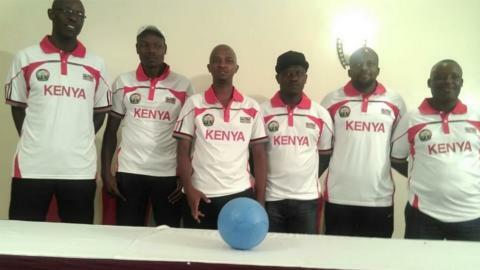 "The appointment of Okumbi is geared towards building local capacity," said Mwendwa on the FKF website. "We have picked our own whom I believe have the capacity to do the job. Personally I love the passing game and believe in our own style." Former international Musa Otieno, who was Williamson's assistant, has been retained.